Microsoft's Surface RT tablet is gorgeous. It's innovative. It's without exaggeration the most exciting new gadget to come along in years. And if you buy one today, you're a fool. The product comes from a company with an infallible track record. There's a reasonable expectation that the product might sell out quickly. Your life will be significantly worse if you go more than a week without the product. Here's how Surface fills out those boxes: Nope, not a chance (especially if the WSJ is right), and hahahaha no seriously no just ugh of course not. The only two remotely possible qualifiers are iPhones and Kindles, and even those are extremely debatable. Surface? Not even close. In fact, Surface deserves your blind trust even less than most other gadgets, if that's even possible. We're 10 days from broad release, and Microsoft hasn't so much as let anyone touch its tablet beyond a couple of cursory swipes and taps. Those hands on posts from this summer? Those were Microsoft PR's hands. This most recent round of coverage? Mostly ogling. Not even Microsoft's first Surface ad shows people actually using the damn thing. I like dancing and clicking as much as the next guy, but I'm not blowing that much of my paycheck on it. That's not to say you should never buy one. Surface looks and probably is terrific. But 10 short days from now you'll have a much better idea of how it actually lives up to the hype. Then (or soon after) there will be reviews, including ours. 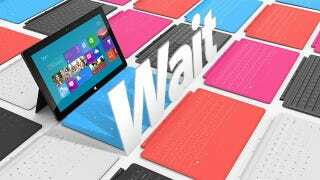 There will be pop-up stores littered with Surface demo models. There will answers to the questions of is this good and, more importantly, is this worth it. It's fine to put your faith in Surface. But until there's a hint of validation, there's no need to put your money in it, too.